Shien Lee has lived in Prague, Montreal, Honolulu and Taipei before settling in NYC. She is the founder and producer of the Dances of Vice events in New York City, with plans to take the concept to international waters, soon – London, please! Shien Lee is also the songstress of the band Shanghai Foxtrot, the only jazz band in the United States to perform jazz, blues and swing classics from 1920-30s Shanghai that is faithful to the era. A fantastic interview is available with Shien Lee by clicking here. 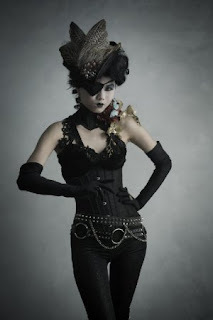 In it, she discusses her love of the New Romantic style, obscura antiques and Illamasqua!